The 2008 Gathering was held near Brighton, England, on September 12th, 13th and 14th, followed by visits to Carden sites in Cheshire and Staffordshire on September 15th and 16th, and in Tipperary on September 18th, 19th and 20th. Nearly 150 family members came to the Brighton event, about 40 to Cheshire and 11 to Tipperary. 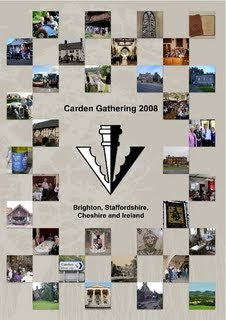 Organisers of the 2008 Gathering were principally Richard (a member of the Fishmoyne branch of the Cardens of Tipperary) and David Carden, town clerk of Burgess Hill in Sussex (a member of the Virgo branch of the Cardens of Brighton). I mostly concerned myself with genealogical matters. A 64-page Report on the Gathering in full colour is available from http://www.lulu.com/ where the following review appears. Masterpiece! The only possible description of this volume edited by Tim Carden containing enjoyable and useful descriptions of every event and lecture during the September 2008 Carden Gathering in Brighton, Cheshire and Tipperary, with masses of photographs in colour. Strongly recommended to everyone with an interest in the family, whether they came to the Gathering or not. See "Carden Books" at the top of this blog and a reproduction of the cover above. A book “Cardens of Brighton” was written by David Carden and Arthur Carden specially for the event, and a revised edition was issued in 2009. The front cover appears above.